Don’t blame The Legal Genealogist. So it’s all their fault. But what better topic to pick up on, here on Halloween 2017, than the topic of unusual ways to die…? But I have come across more than a few interesting records in the course of my years of research. I mean, seriously, you can’t read through coroner’s records3 without coming across the stories. Q. Was your brother in a habit of crossing at the ford. A. Yes, he crossed a few times at low water. Q. Is the ford safe for crossing at the present stage of the water. Folks being shot or drowned or thrown from a train. Seriously… what better topic to pick up on, here on Halloween 2017, than the topic of unusual ways to die…? The research for the NYG&B blog entry was my handiwork (the entry itself was written by Fred Wertz), and I had far too much fun finding these. Another one that didn’t make it into the blog entry was for a woman who, “accidentally fell *with her face* into a kettle of hot water” (23 Aug. 1840) [emphasis added]. Ouch. Great job, you and Fred both!! But yeowch!! for that poor woman!! Right?? Note to time travelers everywhere: stay far, far away from New York City. Hi Judy, fascinating stories. Question for you: my great uncle went to the Chicago world‘s fair in 1893 and never returned or was heard from again. I sent for a death certificate for anyone with his name from 1892 to 1894. Nothing found, not that I expected anything just wanted to cover my bases. However, are we allowed to look through ALL coroners reports, say for one year, in Chicago? Is that information accessible to the general public? Thanks for any information you might have. 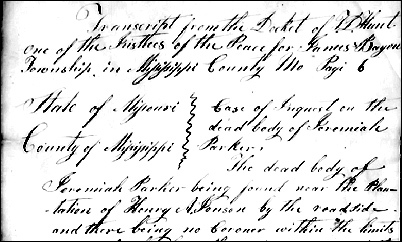 Cook County coroner’s reports are on FamilySearch; some available at a Family History Center and some only on microfilm at the Family History Library so far. Check out the catalog here. My mother never new her Grandfather. She did not know his name and no one had ever talked about him. One of my first discoveries in researching our family was a newspaper article entitled, “Carpenter Culp’s Terrible Tumble.” Alonzo Culp fell off a three story building, rolled down and embankment and hit his head on a log. He lived – for a week. Now how did that not get passed down? He died in 1901 and my mom was born in 1933. We lose these stories so fast. The general wisdom is that we lose all of our oral history in just three generations. Unless… and here’s where we come in as genealogists … unless it’s passed down accurately and in writing.